The Spring issue of RSM (Rubberstampmadness) is showing up in mailboxes and stores right about now. 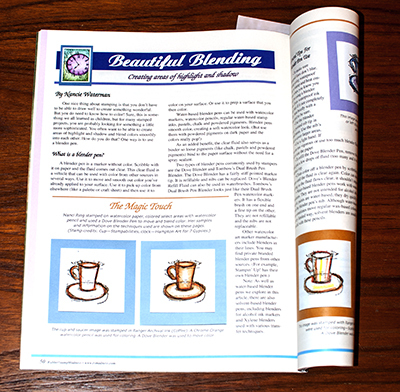 When you open your copy, be sure to turn to page 50, where you will find my four-page article on blender pen techniques. You can use blender pens with a variety of mediums, so in the article I list various art mediums that will work well following each technique/method. It’s the kind of article that you can hang onto as a resource. The focus is using a blender pen to create areas of highlight and shadow – a more sophisticated technique than simply coloring an area with solid color. Nanci Ring stamped and colored the stamped sample images in the article. I hope you’ll get a copy and check it out! Congratulations! I have read all your tutorials and admire your thoroughness.